Gov. Jerry Brown rejected legislation on Thursday requiring that California middle and high schools start no earlier than 8:30 a.m. Supporters of the bill cited research that says delaying school start times could result in better grades, attendance and graduation rates. A study by the American Academy of Pediatrics said insufficient sleep for teens was "an important public health issue that significantly affects the health and safety" of adolescents. State Sen. Anthony Portantino, who carried SB 328, cited that study and one by the Centers for Disease Control and Prevention that both suggested schools start at 8:30 a.m. or later to help students get the optimal amount of sleep of at least eight hours a night. Middle and high schools in California start their school day on average at 8:07 a.m., according to the CDC study. Critics of the La Canada-Flintridge Democrat's legislation say kids could just go to bed earlier. But it's not so simple, the CDC study said, noting that as adolescents go through puberty, their biological rhythms typically shift, so they get sleepy later at night. "The combination of delayed bedtimes and early school start times results in inadequate sleep for a large portion of the adolescent population," said the CDC study. 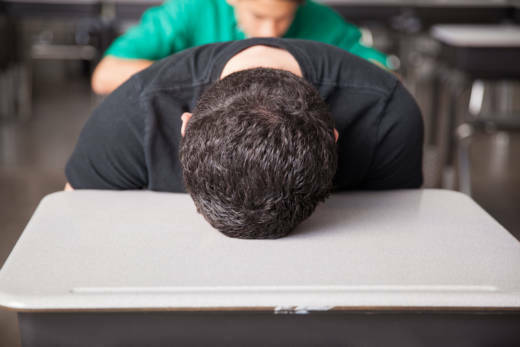 It found that approximately 70 percent of high schoolers do not get sufficient sleep. Opponents of the bill don't dispute the research but say school boards should decide how to run their schools. The California School Boards Association and the California Teachers Association were among those that fought the legislation. They argued for local control, saying schools, not the state, should assess their communities' needs, given the diversity of California's school districts. "What we oppose is a one-size-fits-all statewide mandate," said Eric Heins, president of the CTA, which pressured lawmakers to reject a different version of the legislation last year. A revised bill, which added an exemption for rural school districts, passed the Legislature in August, with the CTA still opposed. Heins and other opponents say later start times could result in unintended costs and consequences, particularly for working parents, who may have to arrange child care or struggle to get to work on time if dropping their kids at school later. There could also be added costs for school districts if they need to pay for additional buses to accommodate the time changes, he said.